Noted Florida philanthropist "feels at home at TAU"
From left: Dean of the Sackler Faculty of Medicine, Prof. Yossi Mekori, and Dr. Ernest Baden. 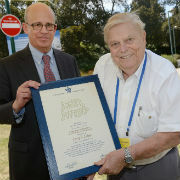 Distinguished intellectual and oral pathologist Dr. Ernest Baden was honored for his generous support for the advancement of medical research at a May 18th ceremony at Tel Aviv University's Sackler School of Medicine during TAU's 2014 Board of Governors Meeting. The Pomano Beach, FL, resident, will establish the Dr. Ernest Baden Institute of Head and Neck Pathology, as well as the Dr. Jane R. Baden Endowed Research Fund for Molecular Research to Elucidate the Etiology and Pathogenesis of Alzheimer's Disease in honor of his mother, who died of the disease. His gift will benefit both the School of Medicine and TAU's Sagol School of Neuroscience. Among the notables on hand to applaud the unveiling of a plaque recognizing Dr. Baden were Sackler Faculty of Medicine Dean Prof. Yoseph A. Mekori and a number of leading Alzheimer's disease researchers and oral pathologists. Many members of the American delegation to the annual meeting were in attendance, including American Friends of Tel Aviv University National Chairman Jon Gurkoff, President & CEO Gail Reiss, and Southeast Region Consultant Joel S. Friedman. Addressing the guests, Prof. Mekori said, "As an expert pathologist, Dr. Baden was quite precise about where the resources should go. I want to convey my deep gratitude for his very important contribution to Alzheimer's research, and to the study of head and neck pathology." 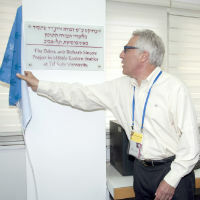 While in Israel — a trip that encompassed his first visit to the city of Tel Aviv — Dr. Baden delivered two lectures: "Differential Diagnosis of Oral Ulcers" at Sheba Medical Center and "The Spectrum of Lesions, Benign and Malignant Neoplasms of the Head and Neck Caused by the Human Papilloma Virus" at TAU. Friedman noted that Dr. Baden has spent a lifetime teaching. 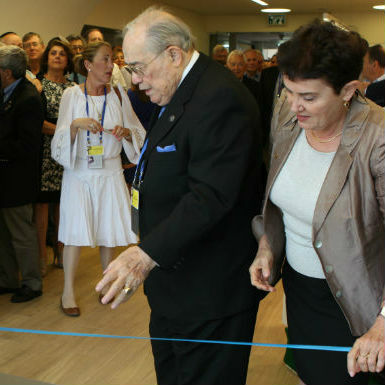 "His great passion is medicine," he said, "and he feels a strong affinity for global Jewry. This contribution is an ideal legacy, melding his love of education, medicine, and the Jewish people." At the ceremony, Dr. Baden spoke of his experiences fleeing from the Nazis during WWII — across borders from his native Germany to France, and ultimately to Algeria where he and his family were interned at a French concentration camp. "I am really a bohemian; I've lived la vie boheme," he said. "I started my medical career in the Near East, studying dentistry and literature at the University of Algiers. I have studied and taught at three universities in the course of my career. I directed a clinic in oral medicine. "And now I have discovered TAU, one of the leading medical research institutions in the Middle East. I find the intellect of the faculty and the student body impressive — and I have never in my life received such a generous reception. I feel at home here." That made his decision to advance research at TAU an obvious choice, he said. "I have no family, and immortality is, in my opinion, a religious concept. I hope these funds will contribute to better society." Dr. Ben Williamowsky, a member of TAU's Board of Governors and AFTAU's Board of Directors, said after the ceremony, "Dr. Baden is a dentist, an expert pathologist, and a philanthropist who is an all-around wonderful person. We're lucky to have him in the TAU family."